I've had various success at gardening. Mostly un-success, I'm afraid. Gardening takes constant, unwavering care and faithfulness. I don't do well with constant. I'm too A.D.D. for that kind of focus. I bounce around from project to project, eager to start a brand new idea, then loosing focus and getting fired up about my next project--before I ever finish the first. My husband and my craft table can attest to this. Then I remember that the only fruit-bearing plant I have successfully grown was the bean plant named "Guess Who" I nurtured in college because we planted magenta beans in a class and I really wanted to grow more. Plus, Guess Who was an excellent conversation piece-and he made me look more domestic to the gentlemen (it was all in my head). Alas, when I moved home for the summer, Guess Who died of neglect--before he ever produced offspring. There's an excellent parable here, people! My past is riddled with other dead plants who never even fared that well. Such as the spaghetti squash starts I bought last year, that never even got planted--they just sat in the spot I was going to plant them until they scorched, withered, and turned to dust. Am I conveying the distress I feel before I give up and move on to safer, well trodden projects? Nevertheless, although there have been days of deep failure in the past, this is not that day. There have been years where all good intentions have turned to anxiety and apathy, but this. is. not. that year!!! I am proud to report that I have cleaned out more of my flower/vegetable beds so far this year than ever in years past. I have even involved one of my children, who loves to "dig in the dirt and look for wiggly worms." We started our peas growing inside as well. I'm going to eat something from my garden this year, dangit! Peas are easy, which I obviously need, and short lived, so they should grow, produce happily, and die before I lose my motivation to garden again (not like last year)! 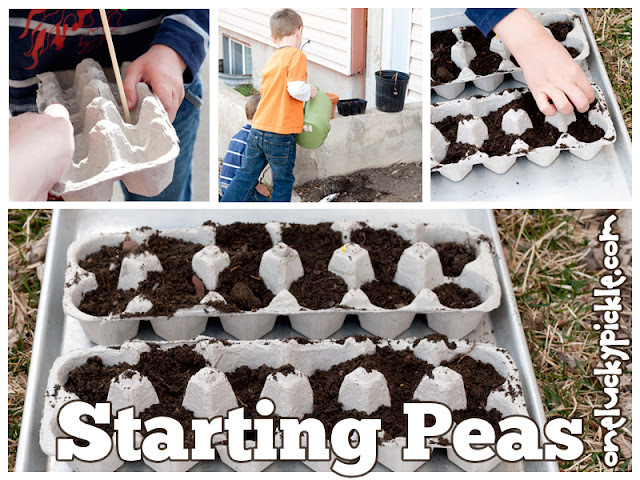 We planted our peas in old paper egg cartons, which are biodegradable--we can plant the carton right in the garden too! We will keep these inside until it's a tiny bit warmer--but starting them inside means we'll get peas that much sooner! First, we poked drainage holes with a skewer, then we moistened some soil. In the time it took me to take the picture, we (they) SOAKED the soil, so we (I) stirred the dirt around until we got some nice, moist, not soaking wet soil. After filling the egg cartons with our soil and placing them on a cookie sheet, we poked pea seeds down in each section, and covered them with more dirt. And now, we watch and wait. I've read that plastic wrap can keep all the water in so you don't have to add more. Alas, I am plastic wrap impaired. Worse than gardening impaired! So I can't keep it tight enough. Instead, I put some soggy paper towels underneath the cartons, to keep the seeds watered without (hopefully) drowning them. I just water the paper towels when the dirt is getting dry. Also, everything I've read about growing plants inside says to keep them by a south-facing window. I don't own a single one! SO, when I remember, I put our cookie sheet outside in the sun when it is warm, and bring them back inside for the evening. I'm terrified I will forget and leave those poor peas out in the cold. I am excited to update you as our seeds grow--hopefully it works out AMAZINGLY and I can put my past behind me! Luck of the Irish to Us! Taking Back My Early Mornings.